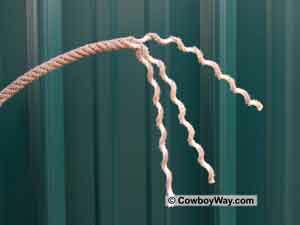 A "stopper knot" is a type of knot used at the end of a rope. 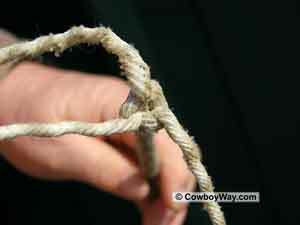 The purpose of a stopper knot is to keep the end of the rope from unraveling, and/or to keep the end from pulling through something (such as another knot or a piece of equipment). A stopper knot is used with a honda knot for both of the reasons mentioned above: To keep the end of the rope from unraveling, and to keep the end of the rope from being pulled through the honda knot. Below: A stopper knot and a honda knot. 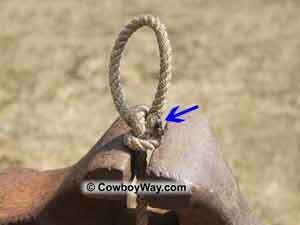 In the text and photos below we'll show you how to tie one type of stopper knot that works well with a honda. ......and untwist the ends for several inches. In the photo below the ends were unraveled about six inches, which is more than enough. Separate the strands of the rope. We have color-coded the strands to make the following steps easier. Choose any strand to be your first strand. 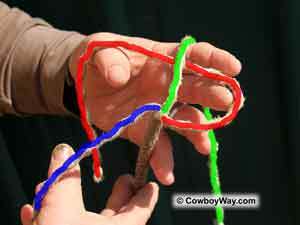 Take the first strand (red) and lay it underneath the second strand (green). 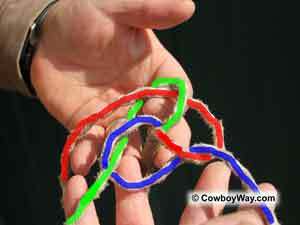 Now take the second strand (green) and lay it underneath the first (red) and third strands (blue). 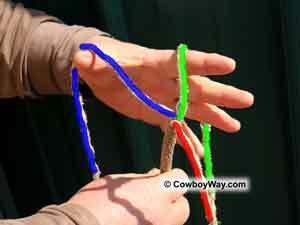 To finish, take the third strand (blue underneath the second strand (green) then up through the loop created by the first strand (red). 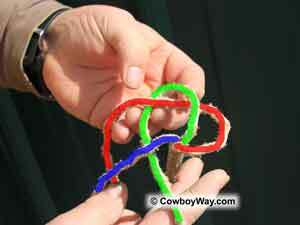 Gently pull on each strand until the knot even, pull each strand much harder to get the knot as tight as you can. 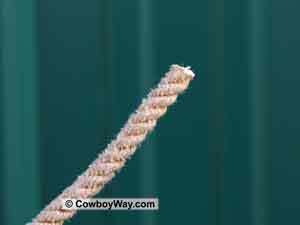 Important: When pulling the knot tight, grip the rope at the base of the knot tightly. Otherwise, the rope is likely to unravel as you tighten the knot. Cut each strand off to about 1/4 inch in length, then burn the ends to seal them. We're using a match in the photo, but prefer to use a candle. 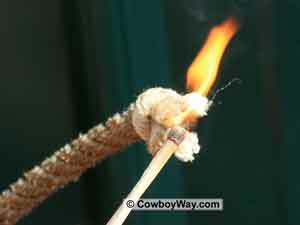 A candle burns longer and more predictably than a match. Below: The blue arrow is pointing to the finished stopper knot. As you can see, after we tied the stopper knot we then tied a honda knot in the rope. 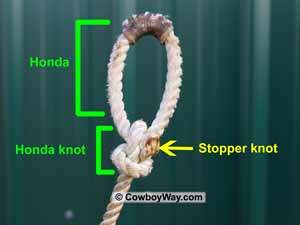 It is the stopper knot's job to keep the end of the rope from unraveling and from pulling through the honda knot. We have loosely closed the jaws of a vise around the rope just tight enough that the honda knot stays on top, and are pulling down on the rope to tighten the knot. When we're done, we'll add a burner to the honda.